MANHATTAN – Dzung Tran closed his watch store on Canal Street on Feb 3. It was Tet, the Lunar New Year, but instead of a day of dancing dragons and fireworks, Dzung packed his family into his Honda Civic and drove down to Atlantic City for a music show and some casino gambling. “It may sound boring, but there is nothing to do in Chinatown for Tet,” said Tran, 50. The celebration of Tet has all but disappeared from Chinatown, a cultural casualty of the Vietnamese community’s decline in the neighborhood in the years since 9/11. It is part of a general decline in the number of Asians living in a Manhattan stronghold that for more than a century has been a magnet for immigrants, tourists and anyone else seeking Asian food and goods. While Asians, with Chinese and Vietnamese historically the two main ethnic groups, still make up more than two-thirds of the population in Chinatown, their numbers have dropped from 79 percent to 68 percent in the last 10 years. At the same time, the white population has jumped from 8 percent to 12 percent. Simon Do, owner of a jewelry store next to Tran’s, recalls the period during the 1980s and 1990s when Canal Street from Mulberry to Broadway teemed with Vietnamese thriving on sales of knock-offs. Then came 9/11, which left Chinatown covered with dust from the collapsing towers for months, and sent tourists and shoppers away, many of them never to return. Ten years ago, Do employed nine or ten people at his store. Today, he and his 78-year-old mother are the only staff. To make up for the lost income, he rents out half the front of his store to three Indians who sell T-shirts and bric-a-brac. Another palpable loss in the neighborhood since 9/11 is the almost total eradication of 246 garment factories, which once employed some 20,000 workers, most Asian immigrants. As business fell off, the factories could no longer afford ever-increasing rents. Some former garment bosses switched to more profitable business like food stores or restaurants. “Most factory owners have moved out to Queens or Brooklyn due to the hike in rent,” observed Nghia Nguyen, 60, a former garment worker who now owns several stores on Canal Street between Lafayette and Broadway. Even the rebuilding of Chinatown works against many longtime residents: They now find themselves priced out of the housing market. In 2006, the New York Times reported that a “parade of condos” was replacing vacant factories. A study by Hunter College found 19 new luxurious high-rises built in Chinatown since 2005. 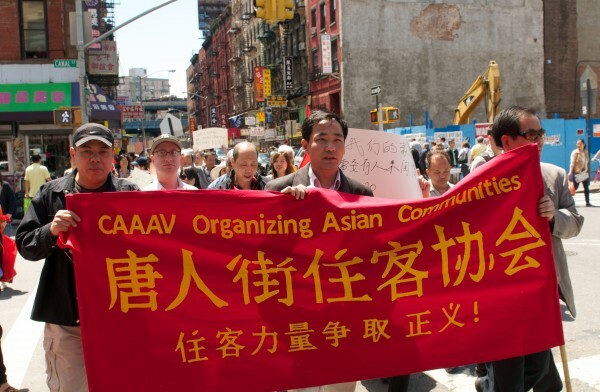 “Gentrification has moved south to Houston Street,” said Wasim Lone of the GOLES Tenant Union during a Chinatown rally against landlords’ harassment held on May 8. 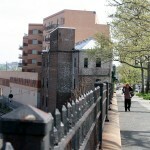 Lone called the situation “a class-war” since “urban young people from New York University and Wall Street want to live here.” According to Lone, higher rent and gentrification made it almost impossible for immigrants to find their footholds. “It kills a cultural pathway to prosperity of the immigrants,” he said. Sue Loh Cheng, 52, is facing eviction by his landlord. He said the rent for his 10-by-10-foot room on Allen Street increased from $400 to nearly $800 a month and, he said, a new landlord is trying to raise the rent again. Cheng, who also attended the rally, said he could hardly get by with the $1,500 he makes monthly as a plumber. “I still have a family to support back in Perak, Malaysia,” said Cheng. Esther Wang, from the Committee Against Anti-Asian Violence, a grassroots community group supporting tenants’ rights, said that apartments in Chinatown’s tenements now were renting for a “crazy” $1,500. Chinatown looks trendier with more upscale buildings and restaurants, like those on Baxter Street and the Bowery. But to some activists, the collateral losses are too high a price for a unique community to pay. Not everybody shares that opinion. Peter Cheng, of the Indochina Sino-American Community Center, said the census data reflected undercounting and the decrease was nowhere near as steep as indicated by the census. “My sense is that Asians in Chinatown are holding steady or might have shrunk slightly,” he said. Those remaining see a real loss of community in a place where Tet once was a fiesta of dragon dancing and firecrackers.